and began a long run out into the world. We ran 3.2 miles together, as far as the campus of the Beaver State's most academically prestigious institution of higher learning, the highly dorky Reed College. path in front of Elliot Hall shortly before we part ways. 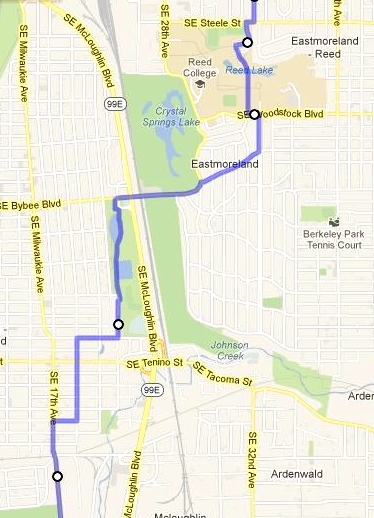 From there, I continued running to the northeast, but the Avatar continued southward. He ran through attractive Crystal Springs Park and through the Sellwood neighborhood, passing right by the legendary "Bins" -- the Goodwill Outlet Store, a sort of controlled-environment dumpster-diving center -- but did not stop or pause, being insubstantial and having no need for material things. The second day's run took him through Gladstone and then Oregon City, the town that was the most important Europeanish outpost in the Oregon Country from 1829 to the 1850s but couldn't really keep up the pace thereafter. Pushing up the hill from downtown, my Avatar ended up at a Starbucks near Clackamas Community College, a nice campus that I've gone to from time to time for work, and once for a 5K run. He'll probably be hanging out there for a few days, until he and I next decide to run. When he runs, I run. When I run, he runs. As the hypermarathon continues, the Avatar will follow Oregon 213 south through the fields and pastures of the northern Willamette Valley towards the charming town of Silverton, and from there turn west and south towards the State Capital, Salem. His first destination is Oregon State University in Corvallis, where outgoing IAT Dork Morgan has invited him for a visit. From Corvallis, he'll cross the Coast Range westward to the Pacific, follow Highway 101 north for a ways, and then head back towards and through the City of Roses on his way to the inevitable eastward journey. In four or five years he'll probably get to the Atlantic. What does this all have to do with DorkFest? 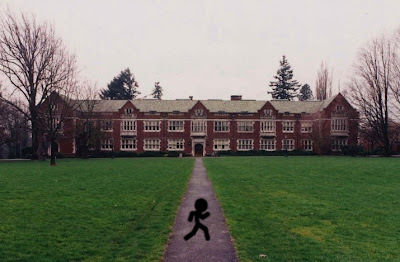 I'm picturing Morgan on a synchronized Corvallis run with your avatar...very stealth-dork. I forget exactly what this is. 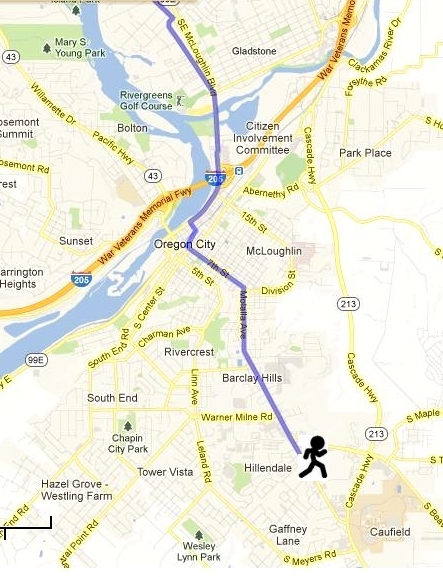 You run the same mileage but are contained in the Portland area whereas your avatar runs the same miles you run but "his" miles can go anywhere? JENNERS! YOU HAVE ELECTRICITY!! I was thinking about you when the awesome destructive power of nature was precisely centered on your nice New Jersey home! 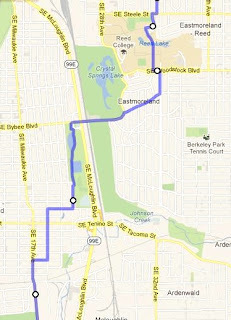 I run whatever mileage, wherever on the globe I may be but usually in Portland, since that's where I live. The Avatar moves the same number of miles down any non-freeway road or reasonable running surface. Right now he's hanging out at a big-box church right at the very southern edge of the Portland metro area, about to bust into open farmland. He's exactly three miles down the road from where he's shown in this post, because I happened to run exactly three miles on Tuesday night. man, i'm going to love this series so much! also, be grateful it was your avatar that ran up that hill in oregon city and not you. that thing almost killed me on a bike.